The National Snow and Ice Data Center announced today, that the Arctic Ice Area Extent has reached an absolute minimum breaking the record minimum of 2007 with still several weeks of potential melting and retreat to go. This has been anticipated for many weeks now with perhaps the most extensive coverage and intelligent discussions over at Neven’s Arctic Sea Ice Blog. This is as big a deal, because an ice-covered ocean reflects much more sunlight back into space in summer than a black ocean does that absorbs more heat: a positive feedback. This is why people in hot climates wear white, not black clothes, they like to stay cool. Furthermore, this decline has been ongoing for the last 30 years and the climate models that policy makers rely on did not predict this level of ice cover to occur for another 20-30 years. 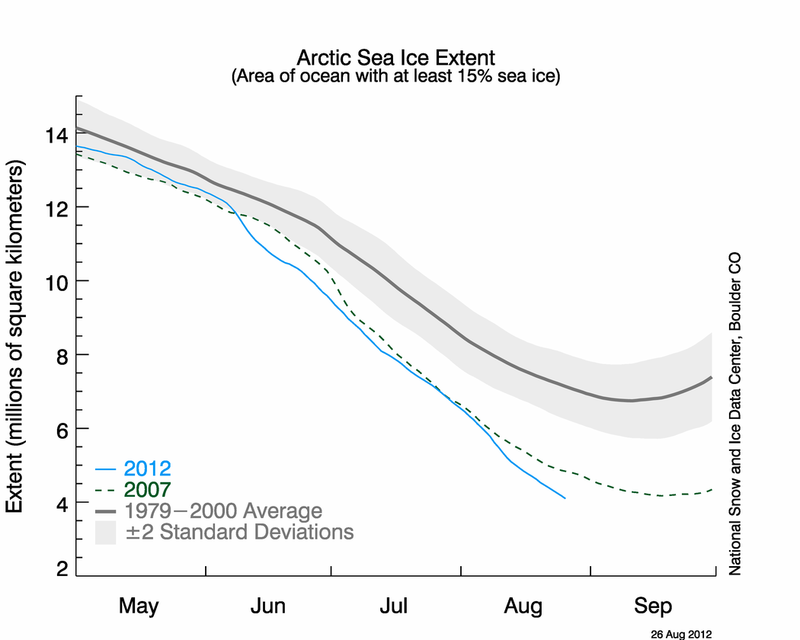 So, the warming climate and the changes it caused are on an accelerated schedule with regard to the Arctic Sea Ice cover. Also, the remaining ice cover is thinner than it used to be, because the multi-year ice keeps leaving the Arctic faster than it can be formed inside the Arctic. Both the Fram Strait to the east of Greenland and Nares Strait to the west of Greenland export this old, hard, and thick ice that ultimately melts further south. The ice that is left in the Arctic Ocean has become both thinner, younger, and softer, making it easier to melt the next summer.